While some ice blew away during the last storm, another round of snow plus more cold along the Lake Superior coast could those spectacular sights open in the next few weeks. From the waters of “Gitchee Gumee,” nature carves out some amazing things along these shores. 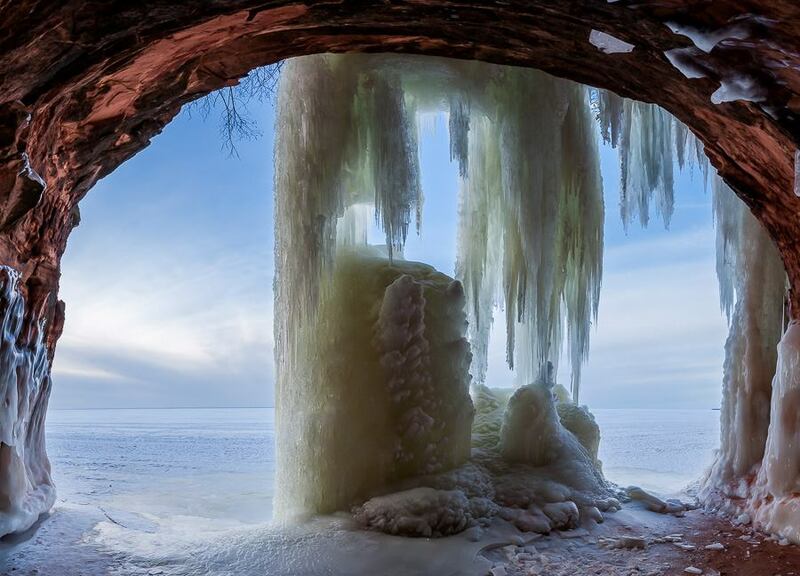 At various locales off the mainland coast in Bayfield County, a series of Ice Caves form from the frigid air and waters to create spectacular beauty; Highway 13 is your ticket for heading out to explore them. The Red Cliff Ice Caves are located just off Highway 13 north of Bayfield. They are hoping they’ll be open soon… the latest updates are available here. You can reach the Red Cliff Ice Caves most easily from the parking lot at Legendary Waters Resort and Casino just off Highway 13. The lot offers 1,000 spaces; accessing the caves themselves requires a 1.5 mile walk. Once you get there, eight good caves await for exploring and photos you’ll be proud to post and share. There is no fee for parking or to check out the caves. The Meyers Beach Ice Caves are more widely celebrated, offering 18 caves and even more spectacular views across a wider area. There is a $5/person admission fee and the walk is significantly longer. It requires covering about 4-5 miles from the main parking lot, which can fill up quickly and can mean walking a longer way to reach the access point. Being larger and more exposed to changing ice and weather patterns, Meyers looks to be on pace for a mid-February opening this year provided conditions continue to cooperate. Meyers is located further west at the end of Meyers Road, 18 miles west of Bayfield and 4 miles east of Cornucopia along Highway 13. If you want to program your GPS, use 90500 Meyers Road. It uses a Bayfield, WI mailing address with a zip of 54814. 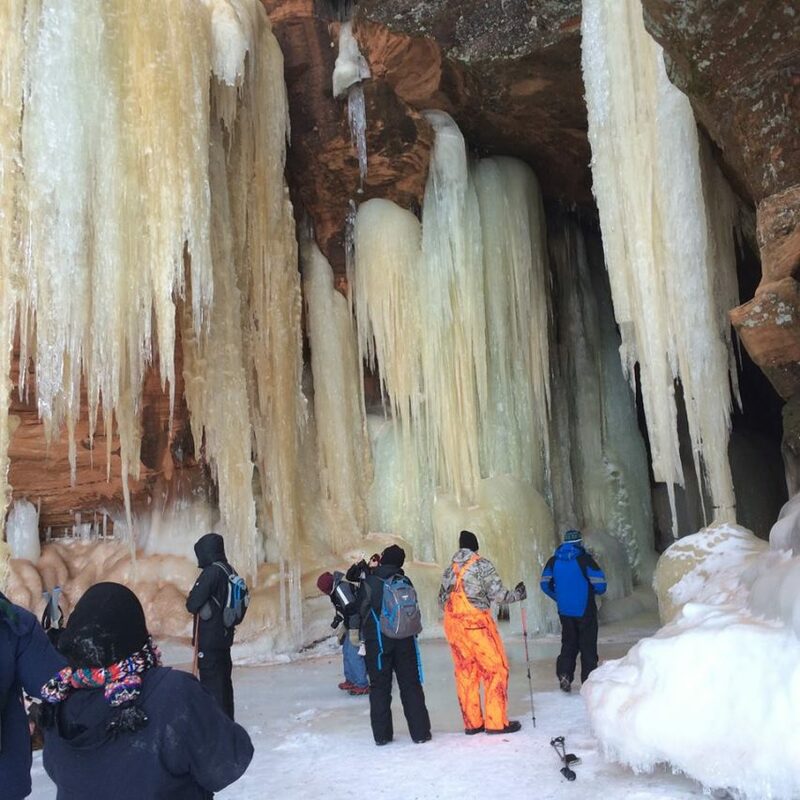 The latest updates are available by phone at (715) 779-3397 x3, from nps.gov, the official Apostle Islands National Lakeshore Facebook page, or right here on StateTrunkTour.com and on our Facebook page.